Steven Spielberg had a tough act to follow. 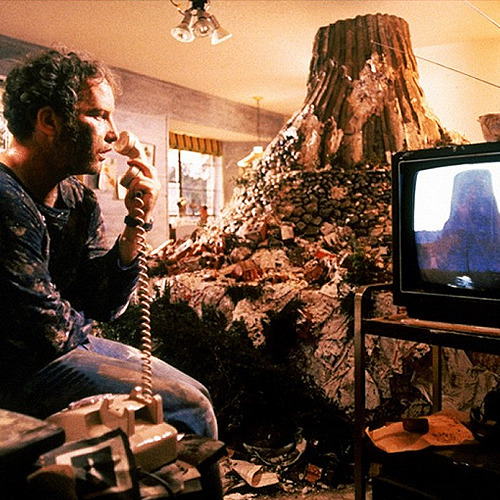 His science-fiction film Close Encounters of the Third Kind came out after his friend George Lucas' epic Star Wars, so would it be able to compete against one of the all-time great films, beloved and held as a turning point in cinema? Truth be told, Spielberg need never had worried. Star Wars and Close Encounters are on two different levels, equally brilliant in their own way. I could even say they are mirror opposites: the former full of gee-whiz adventure, the latter a more introspective journey involving aliens. We begin in the Mexican desert, where vintage World War II planes are found. The strange thing is that they were reported missing thirty years ago. Dr. Lacombe (French director Francois Truffaut) along with his interpreter David Laughlin (Bob Balaban) are puzzled by all this, and the mystery of something 'out there' grows. In India, a group of mystics repeats a five-note melody they all claim they heard from above. The scientists discover when they repeat that melody to outer space that a strange repeated message they get involves coordinates, somewhere in Wyoming. In a parallel story, Roy Neary (Richard Dreyfuss), an electrical lineman with a wife, Ronnie (Terri Garr) and two children. There is something strange going on with the power: a mass blackout but also battery-powered toys turning on by themselves. This fascinates Barry (Carey Guffey) a little boy delighted by all this, but quite frightening to his mother Jillian (Melinda Dillon). As Roy goes to help restore power, something extraordinary happens: an alien ship comes to his pickup truck. While he does not see the aliens, he indeed has had a close encounter with a ship. Soon Roy becomes obsessed with these beings, as are a group of people who have had similar encounters (among them Jillian, who while not obsessed with them does begin to draw a particular pattern over and over). He too sees a similar shape, sculpting it into his potatoes and creating a larger figure. His obsession with that image burned within his mind drives Ronnie to despair, his seemingly erratic actions forcing her to flee with the children, while he is puzzled at her reaction. Barry however, fascinated by the lights and knowing the sound of the aliens, is taken by them, to the horror of Jillian. Finally, the two stories collide at Devil's Tower in Wyoming. Roy accidentally catches the end of a report of a 'train derailment' that has forced people out of this area, and realizes the image in his mind is that of Devil's Tower. He races to the site, where he reencounters Jillian. They are not the only ones who were drawn to the Tower. However, only Roy and Jillian are able to avoid the military protecting the Tower. Lacombe knows that there is more to this than he knows, but it only until they have made contact with the aliens that Lacombe truly sees that the aliens have indeed, 'invited' all those the military has kept away. The aliens come in peace, returning all those they've taken (including the World War II pilots and Barry, to a delighted Jillian), and now Roy becomes a last-minute addition to the crew that will go off with them. It is the rare science-fiction film that portrays aliens as benevolent. While I don't think Close Encounters is the first to do so, it certainly is apart from the mold in that the extra-terrestrials are not here to invade or attack/conquer us. Instead, they are here for benevolent purposes. This is hard to fully gauge because the aliens are held back and back until the final act of the film. Until then all we see are the lights and the ships, and Spielberg gives us a great and frightening moment when Barry is taken. The tension comes from both the situation, where only the lights and dark serve to guide us, and also through Dillon's performance, which captures the fear and terror of the unknown enveloping one. Since we never see the actual aliens we can still wonder whether the aliens are friend or foe. It is the unknown that frightens with Barry now gone. The mixture of innocence and menace is what holds our rapt attention, and not just with Barry. Spielberg is a populist director, not one given to avant-garde pronouncements. Here, his natural optimism about learning that the outsider is not to be feared but explored comes through. Close Encounters allows the mystery to build as we follow two stories: the scientific and the emotional as two figures pursue the same story, one following the mind, the other the heart. The performances are all so excellent. Dreyfuss was a commanding presence as an ordinary man with an ordinary life until his close encounter. His growing obsession is played naturally, slowly, lending moments of comedy (as when he is tearing out all the plants to throw dirt into his house for reasons learned later) but also one fears whether he is quite insane. Truffaut, in a rare English film, speaks mostly in French but does on occasion speak anglais. His performance is strong but more subtle, one who studies things from a distance, wanting to discover the mystery and not overwhelmed with any mystical sense of awe. Dillon as Julian the fearful mother never makes a wrong move, from her concern that her son has wandered off to the terror of seeing him taken to the joy of her only child's return, she is heartbreaking and real and wonderful in the part. The other elements within Close Encounters similarly work wonders. Vilmos Zsigmond's Oscar-winning cinematography (particularly during the Devil's Tower sequence) is breathtaking and beautiful. We also have the special effects, which despite almost 40 years still look natural and real, as if real aliens had indeed come to Earth. The final moment when we see the mothership hover over this massive peak is extraordinary, a climatic moment (no pun intended). We cannot also leave out John Williams' Oscar-nominated score (which lost to another iconic score by a brilliant composer...Star Wars by John Williams himself; how often has he beaten himself in this category). The five-note motif is now part of the American soundtrack, to where one can whistle the first three notes and even those who have never seen the film can return the last two. 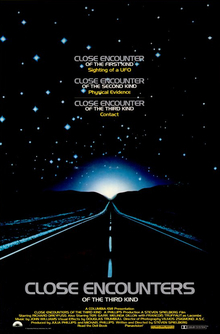 If there is any flaw within Close Encounters of the Third Kind, it is that it might be a little slow. It's a minor flaw but one can understand those who grow frustrated at its pacing. While I did not find it a terrible bother, one does wonder if things could have gone a bit faster. Still, minus that Close Encounters of the Third Kind is a breathtaking, beautiful, and optimistic film. It is an encounter no one will ever forget.